Okaka is a Japanese seasoning that is often associated with rice. It is a simple mixture of dried shaved bonito flakes gently tossed with soy sauce. The flavor can be as light or salty as you wish by simply adjusting the amount of soy sauce. At its most basic, onigiri is a ball of steaming hot Japanese rice that’s salted and molded either by hand or using an onigiri press to form a triangle, sphere, or cylinder shape. There are countless varieties of onigiri and ways to make it. It’s one of the simplest yet most beloved Japanese foods, enjoyed by everyone from small children to adults. Quick and easy to make, onigiri keeps well and is highly portable, making it a convenient bento item. Japanese rice balls are the perfect food for a quick bite between meals or can be combined with soup and other items for a simple and filling meal. While basic onigiri is made with plain white Japanese rice, for a healthier twist many people opt for brown rice or rice mixed with other grains, such as barley. White rice can also be cooked together with ingredients like edamame, wakame seaweed, clams, and ginger, or red beans (known as “sekihan”). It’s also possible to make onigiri with fried rice (chahan onigiri) or rice pilaf. Okaka onigiri are dried bonito flakes (okaka, or katsuobushi) flavored rice balls. This okaka filling is seasoned with soy sauce. The recipe is simple and very quick. A common type of onigiri is wrapped onigiri. 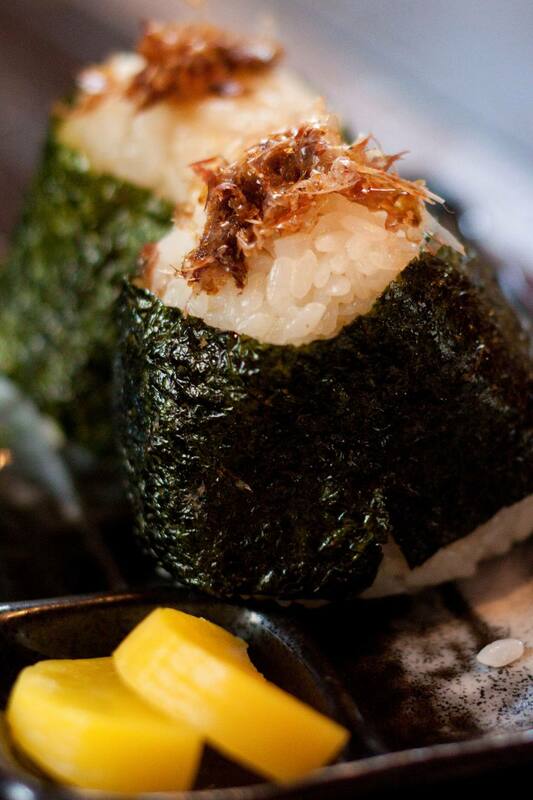 The most common onigiri wrapper is a thin sheet of nori (dried seaweed), but other possible ingredients include takana mustard greens, ooba leaf, tororo kombu kelp, and salted lettuce. You can also try seasoned onigiri coated in sesame seeds, ground shiso leaf, or furikake topping. Furikake is a salty Japanese seasoning made with a blend of ingredients that taste good on rice. Common furikake blends include nori seaweed and egg, ume (pickled plum), shiso, shrimp, and dried fish. Other fillings include salmon, tuna, Umeboshi (pickled Japanese plum), Kombu (dried kelp), fish roe, shrimp, vegetable, ​and chicken. Put katsuobushi in a medium bowl. Season with soy sauce. Put steamed rice in the bowl and mix well with katsuobushi. Wet your hands in water so that the rice won't stick. Place half of the rice on your hands. Form the rice into a round or a triangle, by pressing lightly with your both palms.